It's obvious from the description of "Coco" that you'd look where a RR would cross a road, especially in a place called "Coco". What is not obvious is what the "10" is (it doesn't seem like a countour line), what the "5" is, and what the "5.54" means. Coco, and the location of a RR crossing the road is obvious near the center of this picture of the NW quadrant 15-minute quad. There's no BM marked there on the 15-minute map, though. It is only seen on the corresponding 7.5-minute map. Instead, there are BM marks at 830 and 1214 near Coco. The question is - how do you find the location on either a 7.5-minute or a 15-minute map of one of the less obvious marks - for instance the third one on the list at elevation 669? It has numbers "5", "8", and "4.55". OK, here's Coco with the red cross on the BM labeled 652. The 5 is repeated for each mark on this page. Initially I thought it referred to the line number, however this is line number 6, so I'm not sure of its function (page number?). The 10 indicates the tenth mark on this line. You will note that the previous entry has the same numbering. This is because it is a reference mark for the BM. The 5.54 is the distance in miles along the line to the mark. You can use this to scale the locations of subsequent marks. The description is self-explanatory and should lead you to the mark, which is stamped as indicated. The unadjusted field elevation of 651.633 is rounded to 652 on the topo map. As long as you set the correct datum and coordinate format in Topozone, you can derive coordinates (38° 24.12'N, 81° 25.09'W) for each mark to help with locating them on the ground, realizing that they were plotted by hand without benefit of GPS. It appears that the intermediate marks, labeled U.E. (Useful Elevation according to Dave Doyle) are not plotted in this particular area, but could present an interesting challenge to try to find. They are located at approximately 1/2 mile intervals along the road, with marks 6 through 9 lying between Coco and this BM. Line 6 continues down this road through Pentacre to Quick, then runs northeasterly on a zig-zag course until it hits Leatherwood Creek, which it follows back toward Clendenin. It might be helpful to trace the line in Topozone, extracting coordinates for each little X you see along the way, then try to match the elevation on each one with the listing on the datasheet. Also along line 6, I have the b.m. published on the topo map at Three Mile (elev 636') at about 2.8 miles along; the next one after Coco is at 6.3 miles (826') at 81 25 37, -38 23 27. Neither of these is on the one sheet that has been posted. I'm clueless as to what the first column (all 5s) represents. The second is likely the station number counting from the particular line's origin. (Note the Coco station and its reference mark are both 10.) The third column is the distance in miles for the origin at Blue Creek. And has previously noted, the right hand column is the elevation in feet. One other bit of decipherment: note the stamping on the Coco tablet: 231 SKS 1956 652. I don't know what the 231 is. 1956 is obviously the year and 652 is the elevation in feet. SKS? Look at the top of the sheet for "S.K. Sampsell." BTD - The Maptech 15' quad is from 1907 (reprinted but not updated later). This line was run in the 1950s, so it won't be marked on the map. But as I said above, I don't think all the marks are the sheet are indicated on the map anyway. Based on artmans google pic - I AM able to go and try and look for the coco mark (though it may be on private property - which is what you see right near the estimated location of the mark - its a Columbia Gas installation that is gated). If I find it - it may give us some bearings. My gut tells me all this is one day going to all make sense and fall into place. Do you guys think so? That would be awesome if you can snare the Coco benchmark. Be sure to take pictures — both closeups and area photos. It looks to me like the road, which used to pass under (?) the railroad trestle and continue across Blue Creek via a ford, is now a dead end. But as I see it on the Google aerial the trestle is still there, a bit southwest of where the arrow is on the photo I linked. If you go, be sure to look for that nearby reference mark. A nail in a tree is unlikely, in my experience, to have survived half a century. But you never know until you check. Artman - I will do as you suggested - though it may be a few days (between work and church and family) that I can get out there - it doesn't look to be far from my home, but.....anyone living in parts like this know how long a few miles can take to travel in a regular car! Any thoughts? I have a sneaking feeling (though I still feel lost on how to REALLY read these sheets) that I may have found the area where the references start (see link above) and also start most southernly (big bottom). Mind you I could be totally wrong, it is geting late! Lastly - almost all descriptions say at the end something along the lines of "Painted" now I am SURE someone knows what that means and may have a picture (hoping anyway). I want to emphasize I have no actual knowledge of what I'm saying, but I do not intend to let that stop me! I think you are right: the "0.00" before "Blue Creek 1933" is almost certainly the starting point of one of the numbered lines, and I think it may be number 4. The mark is at Clendenin, at the top of the map. There are several lines meeting there — 3, 4, and maybe 6. But it's just a waypoint for 3, so that can't be right. And 6 starts in Blue Creek. So it must be 4. Sampsell's calculations may be part of the error-correction process that I don't understand at all. I think in traditional leveling, you have to return to the place of origin (or go retrace your steps if it's not a closed circle. If you return to the origin point, the elevation (which at each benchmark is computed relative to the previous one), should check out. That checks, but in the real world it wouldn't be so exact, and there are mathematical ways of resolving the discrepancy, which I think is what Sampsell's computations were about. Disclaimer: I am not a surveyor, and I may be completely misunderstanding the process. If so, I hope someone will correct me, and I will be very pleased to be set right. I think "painted" means just what it says, but there could be a technical meaning I'm unaware of. BTW - a photo hint: in general it's good to have a tight close-up where you can actually read the stamping on the disk. Hard to do, I know, especially with some older disks. And as I mentioned earlier, it's also good to have one or two other photos to see the disk in its surroundings. Point taken on the picture advice. Normally my pictures are much better - but I have to tell you - I was shaking even taking the pic you see on my log, as the disk was RIGHT at the edge of a pretty high and old bridge. I sat a few feet away asking myself why in the world the fellow put it so close to the edge. Shew. After re-looking at the pic - and I hadn't in some time - I am thinking this may be a good one to use the corn starch, or powder, or whatever on (yeah I know - thats another thread!). Thanks for the back and forth - I hope tomorrow many more will weigh in on all the posts. As for the "painted" term... if that is literal - can we expect to still see the "paint." Also - when looking for a nail placed 50 years ago - is it correct to assume i will be looking a good bit up the tree etc. Have people on here actually found some of these? I'm not a tree expert, but I'm pretty sure trees grow from the top, not the bottom. So a nail will still be more or less at the same height. But trees do get fatter (like many of us! ), so it could still be "absorbed" or otherwise gone. Assuming the tree is even there anymore. Tree trunks grow in the ring just inside the bark and outside the more solid older wood. That's why you can count rings to find the age. This means that a nail will stay very close to the same elevation. It also means that as rings get added the tree will grow around the nail. Depending on how much of the nail was originally exposed, it may take years to decades to occur. This is the bane of sawmills, because hitting the nail is very hard on expensive blades and sometimes dangerous to operators. Therefore most sawmills won't accept a log from near a house or barn or on a known fence line. My experience with paint (not for survey marks unfortunately) is that you might find traces of casually applied paint like I expect this was after a decade, and a thoroughly painted surface will retain some of its coat for much longer. The spray marker paints used now are not intended to last that long. Ok here is how I deciphered mine. The Left coloum does refer to the line. CoCo is Probably a Triangulation Station. I found that my lines,marked exactly the same way used them for Control points. The rest is still GREEK to me. But I recovered almost every mark. I used a combination of the topo's and the lines on the Outline sheet. The Elevations are the ones marked with an X 1234 or 1234. Once you get close the descriptions sometimes still work. They did here with some improvements. I hope that Google Earth helps. It is the start for a few of the benchmarks on the rest of your lists. I know you only sent one but mine is 13 pages. The Isolated BM were the hard ones. This makes for a very interesting research project. The four lines that mark the border of this 15’ quad are marked (N) 38 30’ (N) 38 15’ (W) 81 30’ and (W) 81 15’. Using Google Earth I mark the four intersections of those lines. Next I select tools > measure > path and I draw a line from each corner to the next to create a box. This is the search area. I soon found Clendenin at the coordinates 38°29'18.99"N 81°20'53.98"W. But I can not find Big Bottom or Blue Creek. I did fine Blue Creek road (WV57) where it intersected with Elk River Road North (US119). I think this is the start of lines 6, 8, and 12. It would be interesting to see if this was the site of a town called Blue Creek. 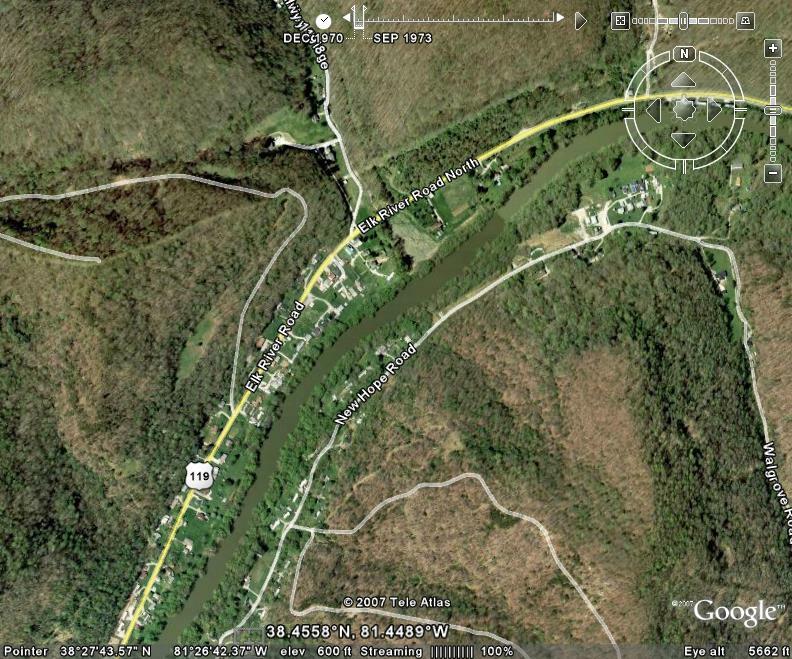 I did find Big Bottom Road and it is lalso abeled Mill Creek (WV48). The intersection of this road and Hunters Road could be the start of lines 2, 7 and 11. It probably needs more research. Ok there is the line from 616 to COCO the marks keep going up the tracks to the other marks I sent you. I think DaveD said UE = Usable Elevation. If you notice some are reference marks just like triangulation stations and are nearby. Well that wore me out. That will give you a little more to work with on or whatever. Blue Creek is a modern community shown on many maps at 38 26 55, -81 27 19. I found some of the the Big Bottom information through the very useful Geographic Names Information System (USGS). Geo - I am going over your info again - and will use it best as I can. I am sure it will be helpful! And Artman - you are correct sir. Big Bottom is now what they call Tad. If you drive through it and blink, well, you've missed it. I am sure many on here can relate. Blue Creek....... same deal. Quick is also part of this mix. I have marks listed on the "Quick Methodist Church" steps etc etc. problem is..... I am pretty sure that church is gone. I fear that alot of that may happen. Trees gone, buildings gone, etc. I just have this sense that they (people who placed any benchmarks long ago) thought of it as somewhat temporary. I certainly don't think they expected folks 50 years down the road to be looking at what they did and typed up and stuck in a filing cabinet. If only we could talk to Mr. Sampsell........I bet we would have all the answers right quick! But you know what 90% of the marks are still there. Here that is in the 4 Quads I have worked on. It is cool to find a copper spike in a UP. Or that chisled square on the cattle guard or box culvert. And yes I have found a few copper washers deep inside trees. But I did not cut the tree open just to prove it. A metal detector works just fine. Yeh Tea on the Road sounds great. Did you get that goole earth overlay to work? If not I can make a KML Google Map. I think the small circles at Coco, Blue Creek, Clendenin, and Big Bottom on the survey line drawing are merely to indicate towns. I do agree with Holtie22 and ArtMan that the third column of numbers is the distance along a route and that the second column is a survey route number. To re-find these stations is to use a 2-dimensional coordinate system along with the verbal description; one coordinate is the distance along the route (a road in this case), and the other dimension is the elevation. I don't think our GPS receivers are good enough to measure the elevation coordinate. The distance along a road coordinate is problematic too. Looking just Southeast of Blue Creek, the road positions have changed quite a bit between the 15-minute map and the 7.5 minute map. Which road version existed when the road distance log was made is unclear. A problem I have with this whole excercise is that the papers that frex3wv got seem to be rather antique in that they don't have any of the BM marks on the road between Blue Creek and Coco (616, 615, 634, 636, 652). I think what we're looking for is a newer edition of the USGS documentation of the same area that describes those 5 marks. It's enough of a challenge already to be looking for marks with scanty description and no coordinates, without looking for outdated marks that are no longer even shown on the topo maps and probably never were. Certainly it would be quite a feat to find any of these old spike, nail, and washer marks, but I think we'd be more likely to want to get USGS data for the 616, 615, 634, 636, 652 marks so we could use it to look for them. frexwv, since you've stepped up to be the test pilot on this, I wonder if you'd consider calling the same person or phone number again to ask specifically for information about those BM marks. (Maybe you have them already on one of your other pages that wasn't posted and can find the info on them.) By the way what phone number did you use? Was it the Rolla, MO 573-308-3500 number? Here is where I was: 38 20.032N 081 29.605W Elev:639 ft.
Area location on map: Big Bottom (aka Tad). BDT: I would be happy to call and ask question - but 2 problems: 1) I am not sure I would be the best person to understand the answer and 2) you mention marks - where are you getting those numbers? Lastly, I notice that in this quad there are a total of 56 pages of marks. Again - I have 1 - 9. Info was recieved by me calling the Rolla office - yes. Tomorrow evening I will be heading to Coco. BDT, the circles may indeed indicate where there are 'towns', but if you look closely at the numbered lines on the map you will see they all have directional arrows on them. Line 14 for instance starts outside the designated quad and continues through and then off the designated quad. If you look at the other lines you will see that they start at one of the circles. Line 3 is the only 1 I see That doesn't have a "circle" where it appears to start. It is pretty easy to see which direction each line goes and distance measurement were probably made in the direction of the arrow from the starting "circles". Just my observation of what I see on the map. OK, well if you send me what you have (the 9 pages) either in email or regular mail, I can pick up from there and call Rolla if you like. I could call Rolla without them if those options won't work. The marks are what I see as "BM" marks on the 7.5 minute quad along the road from Blue Creek to Coco. Two of them are in Blue Creek, one is in Coco, and the other 2 are in between. I recommend that you waymark these on the benchmark Waymarking site and then you can linke that log in your post here and people can see your pictures in the waymark and read your comments in the waymark description. You can also link to just the waymark pictures instead. Take a 'distant' picture as well as a closeup if you can. We'd all like to see something of this area. Yes, I totally agree - it seems that the survey routes originate in the towns. The ones like 10 and 15 probably are originating in towns not indicated because they are on other quads. I think survey 3 starts at the 'town' of Coco and its circle and name were omitted, perhaps because of a lack of room on the drawing. I used to survey caves for many years so I'm familiar with survey strings, loops, intersections, etc. Bill93 is correct about the third column. It is the distance along the level route from the origin of the line. If you the previous page it would describe the origin point for "line 6." Yes and I have some more of them mapped the circle around COCO. It matches the overlay almost to a T,well a couple of T;s there. It also appears from my view that the Railroad Tracks are gone now. But I am not in the field there I just have images. All the BM and UE appear to be the same or a update of an older mark. A nail in a tree..here's one KK1965 that's been there 52 years. It's in a big Pine & still on the outside of the bark. I didn't think to measure it off the ground,but took a picture easily standing on the ground. It was above my head just a little. Now you've got me all excited about finding USGS marks. I called Rolla to figure out how to get my local control sheets and will be submitting a request for my local quads today. The guy I talked to (Frank?) said that the sheets are kept in a folders within folders--each 15' quad has folders for the four 7.5 minute quads within it. To request a quad you specify the 15' quad and what 7.5 quad(s) you want. Also tell them what control you want--vertical, horizontal or both. He also said that the information was outdated and that they welcome recoveries. For those of you trying to find the names of the 15' quads, you may be able to use Maptech's Historical Map site. Good to know about the subfolders on the 7.5 minute quads. I haven't emailed yet, but will be emailing for information on some in my area. The Maptech link is very nice if you live in certain parts of the country. I'd love to have something like that for Michigan. I've also found information on the 15 minute quads from the 7.5 minute maps themselves. If you have the paper maps, or a program which allows you to view the map margins, the 15 minute quad information is sometimes there. If memory serves, the info is in the lower right corner, but I could be wrong on that. In my experience, Maps that had photorevisions and reprints in the 70s have the information, while maps that were produced in the 80s don't necessarily have it. Disclaimer: My observations are anecdotal, and limited to maps in my home area. Using Topozone or Maptech I notice a few things. If anyone can help _ i bet that would go a long way in me figuring all this out. 1) I notice there are points that say BM followed by a number - that is clearly a reference to USGS right? 2) I notice there are dots with a number following - but no "BM" right next to it. What are those? 3) Lastly, I notice there are dots with nothing next to them at all - what are those? And as an update - to compliment my search yesterday (see log above) - I will be hunting the Coco mark tonight. Is finding these helping at all - or no. Not necessarily. There are very few USGS marks in New York City. Most of the bench marks were set byt the CGS in the 1950s and many of these appear on the maps. It just means the USGS used the mark for control when they produced the map, but not that they actually set the mark. Like this: KU1749 - It's "Z 374" in Brooklyn, set by the CGS in 1952. If you click on the topozone link you get this: Topozone and you'll see "BM 62" right on it. In fact my experience is the "BM" symbol on USGS maps is usually better than the text description on the datasheet for finding the station. This is doubly true for triangulation stations (which are little triangles and haven't been much discussed on this thread). Never noticed dots. What I see all the time are little x marks. Those are usually USGS stations in between the disks (nails, chiseled squares, etc.) and are typically in rural areas. Generally I don't see them in the maps for cities. Here's an example: RF0157. It's for a bench mark in northern Maine set by the CGS in 1927. Here's the map: Topozone. Now click on the map pan button (green arrow head) at the upper left of the map frame. You will see a mile or so up the tracks a couple of X marks with numbers. There are intermediate benchmarks and are not in the database. Since the line was run by CGS, not USGS, I'm not sure where you'd ever find the data on these. There is a whole section on the symbols including everything we've talked about here. Read though it. Tons of stuff you may never see on any one map. I have looked unsuccessfully for an online guide to the now-abandoned 15' quadrangle maps. Not to say there isn't one, just that I haven't found it. Meanwhile, I discovered a hard copy resource that is likely to be in a good research library, not your local public library: Moffat, Riley Moore. Map Index to Topographic Quadrangles of the United States, 1882-1940: A Graphic Bibliography of Out-of-Print Topographic Maps (Western Association of Map Libraries, 1986, ISBN 0939112124, and, like the maps it describes, it is also out-of-print). well - excuse the pun - I guess they are wells. I answered my own question by looking at your link. Sorry about that. Funny though - I see benchmark symbols mentioned but that section is so faint its tough to make out! Not sure if this is what he was referring to or not, but I was wondering about these. In this section of topozone, there are two, one near the left, and one near the right. They look like benchmark triangles, but aren't labeled. The one on the left is actually cut off, because the line (horizontal) through the center is the intersection of two adjacent quads, both in the 15 minute and 7.5 minute series. I made a short search in the area of the one to the west, and found nothing. However, it's possible there was a mark there 50 years ago and it was destroyed. It appeared the area had been used as a gravel pit, and the coordinates I entered based on the topo location were about 20 feet off the edge. It seems strange though to have the triangles and no "BM" notation. I thought they were buildings but wells is most likely right. The dots seem to be associated with the structures of the area which is what I was going to suggest until I saw your edit. If you are referirng to those purple dots in the river flood plain, I don't think they are control marks at all. I'm guessing they are some physical feature, hummoks. (wells are possible but that seems strange in a flood plain) whatever. Yes, I think those are triangulation stations, but I bet two map tiles have been put together (note the color change) and the tops of the symbols are cut off. So that pretty much means it's two maps images stuck together. Looks like it was just bad luck that those stations were right on the dividing line. Tri-stations are usually, but not always are labeled with the station name. The even have multiple copies of certain maps. Some gpo back to the late 19th century. I use this resource all the time. MapTech also has some: Maptech Historic Maps which duplicates the UNNH maps plus extends down to Virginia. I guess in the mid west and the west coast, they don't save things! Maybe I misunderstood. I thought the earlier post was in search of a guide to what 15' quad covered what area, not the maps themselves. I have often used (and mentioned here) the Maptech historic maps site. Great resource. when I look for the coca mark tonight- I may go alittle further (if I can and if time allows) and look for a ref. mark or 2. My question is - description reads RR spike "painted".............. what are they meaning when they say that? surely the spike wasn't painted on, or was it? has anyone found one of these? does anyone know what I should be looking for? Also - I see the distance line between bm's and ref. marks and other ref. marks along the line etc. Will this be accurate? Can I use my car to gauge this - or is it "as the crow flies?" Sorry, I misunderstood. It's good to know folks use these historic maps. The small square dots are buildings, maybe houses, maybe oil well sheds, or any other building. The purple version means that it's new. The Coco reference mark is 72 feet North of Coco. The road distance for both Coco and the reference mark are the same number, 5.54, so the 5.54 number will not be useful in finding the reference mark. 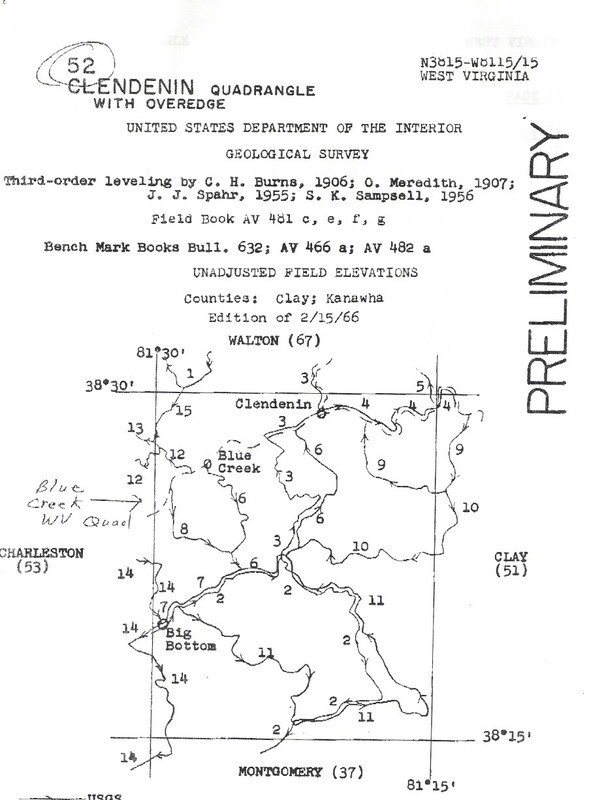 frex3wv sent me .jpg files of all 9 papers received from USGS (pages: front, index, and pages 8 through 16). One has an index of marks on the Clendenin quad (15 minute, I'm sure). It has, very surprisingly to me, 73 USGS marks (! ), and 6 USC&GS marks (evidently used by the USGS) marks listed with the page number where the description is for each one. Page numbers listed on the index go from 3 up to page 56. All this is for one 15-minute quad, apparently! Also surprising was that none of the BM marks I see on the present topo map (616, 615, 634, 636, 652) are in the index. I called the Rolla office and asked specifically for information on one of them (BM636, near where it says "Three Mile" just a bit SE of Blue Creek). I will be faxed the information tomorrow, she said. 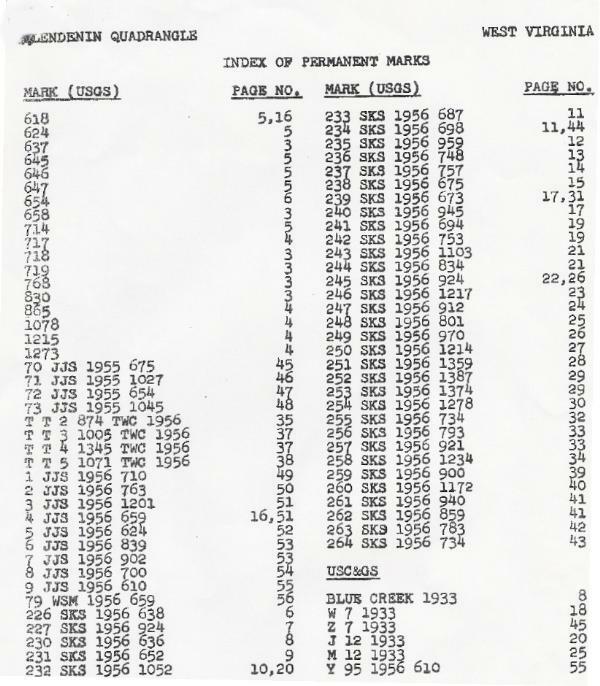 If they can find information on the BM636 mark then I will ask why it isn't in the index that frex3wv got, etc. Edit: I did get a fax already and I found that I misread the index , and the BM636 mark is in the index and the information about the mark is listed on page 8. By the way, that tablet is marked "230 SKS 1956 636" and I asked about the number and was told that the 230 means that the mark is on the 230th survey run that SKS did. According to page 8, the mileage numbering that is on page 8 and page 9 (the page we've been looking at) starts at "BLUE CREEK 1933" a USC&GS mark at elevation 616 in the town of Blue Creek. At this point, I would advise anyone requesting USGS data for marks on a 15-minute quad to be sure to ask for the drawing (with the numbers and arrows), the index sheet, and ALL the pages for the 15-minute quad. (For the Clendenin quad, this would be 58 pages, at least.) I say this because the index seems to have no way to separate the paged information by 7.5 minute subsets. The lady at the USGS Rolla Mo office gave me their toll-free number 1 888 275 8747 (and press phone menu selection number 2). This is starting to make the NGS database look rather small in comparison. Coco - as promised - took tons of pics so y'all could see what google earth could not show you - hope you enjoy. Wish you could have been there! Question remains - have my finds helped us figure out this process at all? If anyone ever finds an online resource for 15' quad boundaries for the rest of the country, please let me know. Meanwhile, I have a copy of a copy of the boundaries for California. I might be able to figure out which 15' quad you need for a certain city, so drop me a line if you want me to try. Just wait till you climb to that top of a mountian and find where Lewis and Clark walked. Or a Transcontinental Arc from 1879-1880. Or well you will catch on. Daved and I talked about this one at the Last Lewis and Clark Event. He knows all so well all the feeling we will cross paths with. I know I know- you guys are thinking "what, ANOTHER question from this guy - sheesh - we haven't even figured the usgs sheets out yet" but I have to ask. The sheets I got were 1956 marks...... are there older ones around me do you think? and is there a way to tell - without searching forever, what the oldest ngs or usgs mark are in my area? Absolutely! We're new at this USGS mark revovery and data-reading and your experiment of getting some USGS data with the survey string drawing and using it to actually set out on an expedition to find a coupld of these marks came at just the right time! We have all learned a lot through your interest in getting the process going. As to your question on finding the oldest marks, you can use the NGSREAD program along with Google Earth. NGSREAD (a program I wrote) has a filtering function (monbefore) to show on the Google Earth map only those marks with an old monumentation date (you choose the date, such as only-marks-set-before-1920). This program works with NGS .dat files obtainable for a county here. It only works with NGS data (which contains some USGS marks). Lest we forget - as a part of this whole USGS experiment - there are also quite a number of horizontal control stations out there like this one. These can be interesting (and challenging) to search for because even though you are given the coordinates, they are typically in NAD27, and the accuracy is such that, on some stations, such as the obsolete transit traverse ones, your GPSr may be more accurate than the published coordinates. They are still useful to report on, however, since the permanent mark already exists and can be incorporated into future control surveys only if the people doing those surveys know of their existence. NGS has a free program to convert 27 to 83 datum.